Anchoring techniques, how to choose the best type, size and style of ground tackle, including chain and rode, for your boat. For me, anchoring for the night in some quiet, out of the way spot, far from the maddening crowds, is one of the great joys of boating. But to be able to enjoy the experience it is necessary not only to have complete faith in one’s ground tackle but be prepared to do whatever is necessary should conditions deteriorate. I should first mention that there are many areas of the seabed were 'dropping the hook' is forbidden. You need to check on your (up to date) chart to make sure there are no restrictions in your chosen area. It could be that there are restrictions because of underwater cables, pipe lines and the like, but there are also an increasing number of areas where there are restrictions for ecological reasons. In some places mooring buoys will have been sunk to allow you to stop without having to disturb the delicate bottom with your ground tackle, use them in a first come first served manner. But even if you do not intend to use your anchor, the skill is an important one which you need to master just in case the unexpected happens. There are a number of things to be taken into consideration when choosing an anchorage. The weather and sea conditions, is there sufficient shelter and will it remain sheltered during your stay and should it change is there an alternative plan. 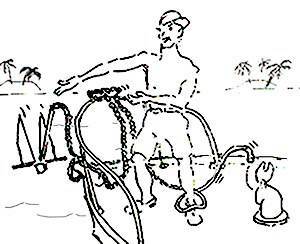 Will there be sufficient depth of water during your stay and within your swinging circle. The state of the tide and the strength of flow or any other current strength. Wind strength and direction, while boats will normally lie to the wind this may be affected by the tide or current strength. The nature and condition of the sea bed, this can be found on the chart. Are there any local hazards such as cables, rocks or fishing nets. The position of any other vessels in the area, is there sufficient room to lay enough scope and swing. Take note of where the other boats warps are lying and try not to foul them. If you intend to go ashore how far is it and is there a suitable safe to land. The scope is the amount of rode paid out when a boat is anchored. The length of scope should be determined to cope with the greatest depth of water over the length of your stay, depending on the state of the tide. The very minimum length for an all chain rode should be four times the distance from the bow roller to the seabed. With a combination of chain and rope the scope should be longer say a minimum ration of 5 to 1. The more scope let out the better the anchor will hold, a ratio of 7 to 1 is a very reasonable length. 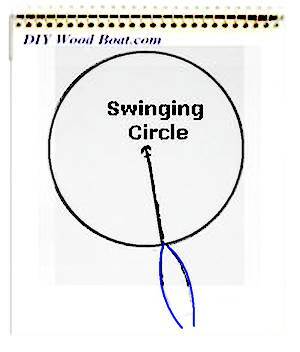 If the wind gets up increase the ratio accordingly but be aware of the increase in the swinging circle especially in a crowded anchorage where everyone else may be letting out their chains. Not all boats will react the same way, different hull configurations may cause some boats to swing out of unison with their neighbours. Be aware that the depth registering on your depth sounder may be the depth under the keel, it will depend on how your sounder is set. If this is the case the height from the keel to the bow roller must be added to the sounded depth at high tide before working out the scope. Anchoring is a simple operation, much easier than tying up to a dockside. There is no need to rush and panic, take it nice and slow and easy then enjoy the peace and quiet. Once you have chosen you spot it's always a goad idea to slowly motor around check the depth and have a good look around and try to visualize where your boat will end up once all the scope is out. Make sure that everything is free and ready to let go, flake out, on deck sufficient rode and cleat off the bitter end. Then head up wind or into the current put the engine into neutral and as she comes to a halt lower the hook to the seabed. Then as you go slowly astern let out approximately a third of the rode, snub the line around a cleat to start the anchor digging in. Once you see and feel the tension on the rode as it digs in, feed out the rest of the rode while still in reverse. When it is all out make sure it is properly set by increasing the power in reverse for a few moments. If she doesn't set you will have to haul in and restart the entire process. Before you switch off the engine take a few bearings on some shore objects, preferably transits just to check that you are not dragging. Make a note of these so that they can e checked any time during you stay. If you intend stopping overnight remember to rig an anchor-light. My own preference is for a good old fashioned hurricane lamp hung just above the bows, this needs to be a good quality one which won't blow out overnight if the wind should get up. An oil lamp will not drain the batteries and placed low is more likely to be seem by any boats entering the anchorage in the dark. When you are in an area where there isn't enough room to swing you will need to set a second anchor off the stern. The simplest method is to set your bow anchor first and make sure it is deeply planted. Then, fall back, at least three times the needed scope, while feeding out the rode, drop the stern anchor then as you let out the stern warp haul in on the forward rode until you are in between the two. You could drop the stern hook first but be very careful not to foul the propeller with the warp. Most boats will, when lying to one anchor end up facing into the wind, this is usually the most comfortable position. However, there may be occasions when there is a strong current or tide pushing the boat off the wind, in this case you may be more comfortable lying at an angle to the rode. 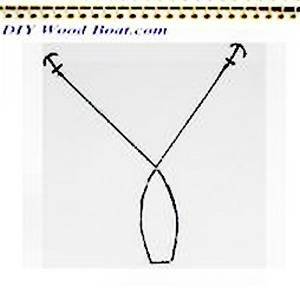 This can be achieved by either moving the warp from the bow roller, then hanging it to one side or by running a spring from the chain to a cleat amidships. Normally the weight of an all chain rode or the elasticity of the rope will dampen any shocks from surging, however, if this does become uncomfortable a snubber can be rigged to take the strain. If the wind does get up or is expected to you may feel the need to drop a second hook from the bows. This should normally be set at an angle so the boat when settled is riding equally between the two. You will probably need to feed out the first rode while motoring to the drop area for the second hook. An alternative if there is sufficient swinging room is to drop a second anchor in tandem with the first and clenched to the rode of the first. As a singlehander I have sometimes looked at the various arrangements for letting the hook go while still sat in the cockpit. These arrangements usually involve a trip-line with some sort of stop which when pulled allows the chain to run. However, I prefer to be in the bows controlling the laying of the rode. My practice is to have everything ready on the bows, motor towards my chosen spot, just before getting there put the engine into slow astern with the tiller lashed then walk forward. By the time I get to the bow the boat will just about have stopped going forward, then as I lower the hook she will have begun to go astern. For fishermen who like to stop and go several times without having to haul in the hook every time there is a cunning system sometimes called the Ionian system. The chain is fed through a large metal ring or shackle attached to a large buoy. When the boat is at rest the weight of the hook and chain pull it through the ring and onto the seabed. As the boat powers forward the chain is pulled through the ring and the buoyancy of the float lifts the anchor. A spring between the chain and a cleat on the stern will help when motoring forward and a control line can, if wished be attached to the buoy. When you are ready to leave, first look around and decide which way you intend to go once the hook is free. Check everything is stowed ready and that the foredeck is clear and the warp free to run back down the hawse-pipe. Start the motor then idle forward while gathering in the line or haul forward on the rode. When the rode is straight up and down, haul in the hook. And don't forget to stow it securely before proceeding. Occasionally the hook might not break free. If it is simply well dug in it can be freed by powering forward, just be careful not to damage the bow on the chain. Sometimes it pays to be patient and allow the buoyancy of the boat to free it from the sticky mud. The worst case is if the hook has snagged on a mooring chain or cable or even an old wreck. However there are a few techniques that can be tried apart from diving down to it. If it is a chain or cable which can be hauled near to the surface, then a rope can be passed under it to take the weight while the hook is lowered free. 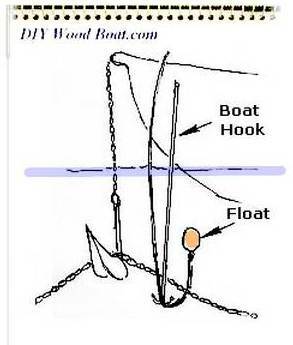 To get the rope under, use the boat hook and have a float of some sort tied to the rope so that the end floats back to the surface. If the snag can't be hauled up, try shackling a loop of chain (attached to a line) around the warp , haul on the warp so the shank is as upright as possible, now lower the loop and try to maneuver it over the shank and as far as the crown. Slacken the warp and haul on the line. Most anchors have provision on the crown for attaching a trip-line. The usual practice is to attach a marker float to the free end. Others prefer to bring the free end on board. I have found that trip lines can often cause more problems than they solve. They can so easily become entangled with the warp reducing a long scope to a large tangled lump and they can accidentally trip the hook when you least want it to. On the rare occasion where the hook is well and truly stuck and you need to leave in a hurry, the only other option is to cut the warp and tie a marker buoy to it so that it can be retrieved at a later date. 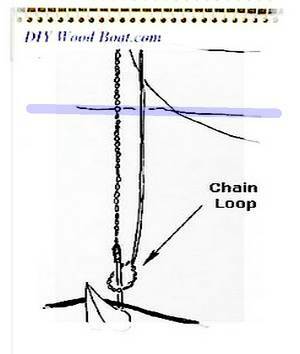 It has become common practice, particularly in production boats to stow the hook over the bow roller and the chain in a locker right up in the bows. While this may be convenient in many ways, it is not good practice to concentrate too much weight in the ends of a boat. Weight in the ends will contribute to pitching. Your boat will ride more comfortably and safely if you can position the chain locker nearer to the center of buoyancy and once under way remove the hook from the bow roller and stow it further aft. Despite the proliferation of marinas there are still many delightfully tranquil anchorages all over the world. There really is little to compare with spending an evening secured by your own ground tackle, far from the maddening crowds and the light pollution, except perhaps for being woken the next morning by the gentle lapping against the outside of the hull and the sound of the birds.